There are many different cat diseases that can impact your pet, but certain illnesses are among the most common. If your kitty isn't acting like herself, peruse this list of symptoms and make an appointment with your vet. Abscess Swelling, fever and sometimes lethargy Typically caused by a wound, such as from a cat fight Antibiotics prescribed by your veterinarian; surgery is sometimes required. Constipation Difficulty or inability to pass feces Caused by age, fur balls, constipation and dehydration Try adding canned food (slowly) to the diet; make sure your cat is hydrated and take it to a vet if it grows lethargic. Distemper Vomiting, lack of appetite, lethargy, diarrhea, seizures A virus that is quite deadly to cats Antibiotics and fluid to prevent dehydration; chances of recovery are not good. Feline Infectious Anemia Anemia, lethargy, yellow gums, weight loss Sometimes caused by underlying conditions, such as FeLV Treated with antibiotics; cats should be tested for FeLV. Feline Leukemia Swelling in lymph nodes, loss of appetite, poor coat and skin and many other conditions Coming in contact with the bodily fluids of an infected cat Feline Leukemia cannot be cured, but the cat's life can be extended with various medications and treating issues resulting from the disease. Mange Skin rash, red bumps, itching Caused by a parasite called Cheyletiella mites The vet will take a skin scraping to diagnose and will prescribe oral and topical medications that will kill mites. Antibiotics are often prescribed to treat any infection as a result of scratching. Poisoning Trouble breathing, staggering or tremors, lethargy, vomiting, decrease in appetite Caused by ingesting a toxic substance Cats often react dramatically to toxicity. Take your pet to the vet immediately. Different poisons require different treatments. Worms Appearance of worms in stool or cat scooting rear end across floor Worms are picked up from outdoors, other pets or ingesting fleas and other parasites. Take a stool sample to your vet. He will be able to tell exactly what type of worms your cat has and prescribe the appropriate medication. While the list above offers just a few of the more common cat illnesses and their symptoms, there are many more cat diseases out there. Knowing the symptoms and recommended treatment can help you make an informed decision if your cat faces one of these illnesses. 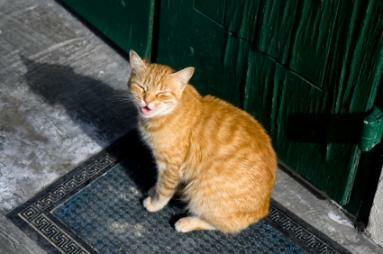 If your cat has minor symptoms, you may be wondering if a trip to the vet is necessary. While symptoms such as lack of appetite can indicate a serious problem, cats occasionally experience one or two symptoms that seem to disappear on their own without treatment. Just like humans, cats can have bad days where they simply don't feel well. Knowing when to make the trip to the vet or rush your pet to an emergency office can impact your cat's chances for survival. Lethargy: If your cat has been extremely lethargic for more than a few hours, refuses to play with her favorite toys or respond to your attention, it is time for a trip to the vet to make sure there isn't a serious underlying illness. Vomiting and Diarrhea: If vomiting and diarrhea go on for more than 24 hours, it is time to take a trip to your regular veterinarian. One of the biggest concerns with ongoing vomiting or diarrhea is that your cat may become dehydrated; this can cause other serious health concerns. Convulsions: If your cat has any type of seizure, take him or her immediately to your nearest vet's office or emergency medical center. Convulsions can be a sign of many different illnesses. The vet can give your cat medication to help prevent another seizure and monitor your cat for additional attacks. He or she will likely run a full blood panel to try to find the root cause of the seizure. Yowling: A cat that goes from room to room or follows you yowling may be in distress and trying to communicate this with you. You know your cat better than anyone else and if this is unusual behavior, keep a close eye on your pet for other symptoms that might warrant medical intervention. Whether you think your cat might have feline diabetes, he can't stop sneezing or you suspect your cat may have Cat Flu, you will find a huge collection of articles at LoveToKnow Cats that will help you isolate specific feline illnesses and symptoms and figure out how best to proceed with treatment for your cat.